PeaHen Pad: New house colors! Here is the way our house looked a few weeks ago. It desperately needed some new paint. The existing paint, even when cleaned was fading and had patches all over it from rot that we fixed on the siding. The white trim and railing was dingy so it cried out for some new color. Here is a Before pic of our house. On the Sherwin Williams website they have this fun color visualizer tool that you can use to try on colors. Here is the link. Pardon my rendering of my house but my hands were a little shaky when drawing out the lines. The color on the siding that you see is actually a little darker than the colors we chose. 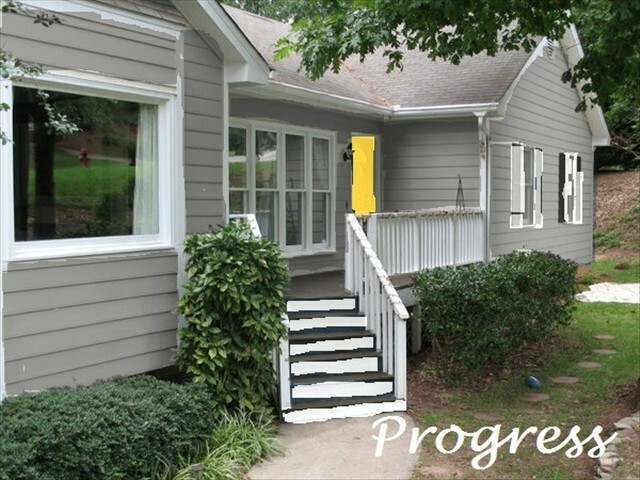 But we did go with the same door color (Cheerful by Sherwin Williams in high gloss) and deck/shutter colors (Thunder Gray Porch Paint by Sherwin Williams.) 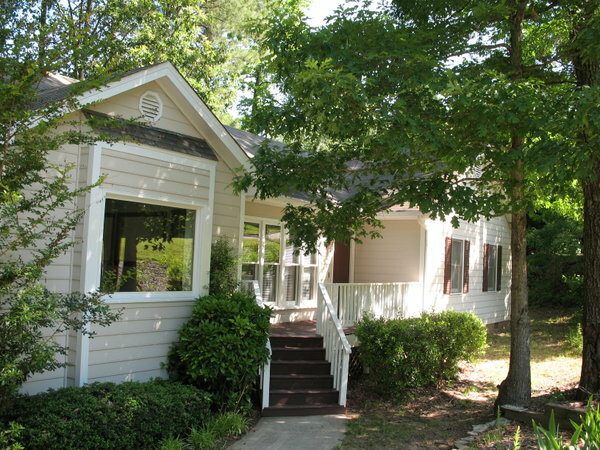 We ended up choosing Gray Clouds by Sherwin Williams in Flat for the siding and pure high gloss white for the trim. All the paint is Emerald by Sherwin Williams. Another angle of that side with the fireplace. I love the way the front steps came out. That door really is so cheerful! This is an after shot of our back storage door. The thunder gray reads brown, black, or dark gray depending on the light. And finally our back door that used to be blue. And once upon a time our house looked like this (about 5 years ago.) What a difference some paint, a new roof, and some landscaping makes. Hope you like the new house colors! We are loving it and feel like we have a whole new house.